What is a cajon drum? | Gear Acquisition Syndrome!! For all you gangstas of the groove out there, today’s post is an insightful reminder – there’s more than one way to skin a drum! Sometimes all it takes… is a couple PLANKS. Of all the wooden contraptions assembled throughout the centuries, the Cajon drum has to be one of the simplest, yet most efficiently pleasing creations ever. Musical instruments are typically not as simple and approachable as the cajon, which is probably why its popularity doesn’t diminish with time. What is a Cajon drum?? In a nutshell, it’s simply a box that you hit with your hands like a drum! The sounds you produce when you whack it can sound either low, like a bass drum, high like a snare, or somewhere in the middle like the tom-toms on a trap kit. 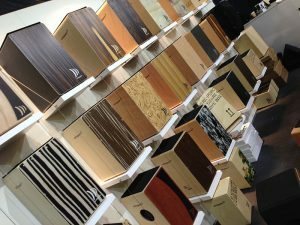 These days, plastic has usurped wood as the material of choice (at least in the low-price options), but regardless of the construction choices, the end result is a convincing set of tones that are making more music today than ever. The South American country of Peru and its concomitant indigenous cultures have bequeathed to us many revolutionary developments: agricultural technology; weaving; pottery; gold and silver work… all these can be traced back to Peruvian people groups in those dramatic mountains and valleys near the mighty Pacific Ocean. For musicians, they passed to us a singular instrument that has stood the test of time: the cajon! The 1500s were a terrible time for Peruvian people groups. 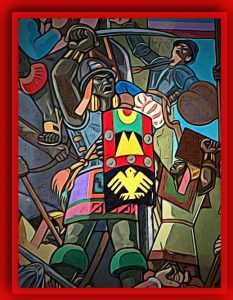 It was the century that Spain decided to invade Peru, their eyes wide and their mouths salivating for what they knew was an area replete with gold and silver. 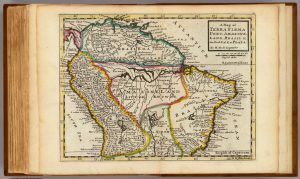 Francisco Pizarro, a Spaniard with thirst for riches and fame, had sussed out that the Incan Empire was quite a rich one while he was stationed in Panama, in the newly conquered territories there. In 1524 and in 1526, he tried to conquer the Incan Empire in Peru, then led by Incan emperor Atahualpa, but was sent packing by the Incan resistance with his greedy tail between his legs. Didn’t stop him though. He came back a third time with even more military strength and finally captured Atahualpa, which essentially established Spanish rule. Those whom the long genocidal war didn’t kill mostly succumbed to the disease epidemics that the Spaniards brought with them. Within a few decades, the Incan culture and peoples of the 16th century had pretty much been decimated. The Peruvian native cultures just couldn’t protect themselves from the vast numbers Spain sent against them. Yet, from out of that rapacious slave and slaughter-fest, something beautiful emerged. An unexpected instrument. A way to find a little joy amidst the suffering. The cajon. See, the Spanish conquistadors in the New World often brought with them African slaves, both to serve them in their newly “acquired” territories, and to serve as spear fodder in their invasion armies as they tried to take over mile after mile of sprawling land masses that legitimately belonged to other people. Africans have a long, fascinating history of extremely rhythmic, energizing music, performed on improvised instruments that often brought communities together for song, dance, and vibrant celebrations. Music in Africa has for centuries been a successful means of cultural cohesion and local pride, and hand-made African DRUMS were often the focal point for most tribal performances. 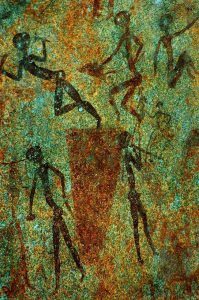 Even ancient rock paintings depict it! 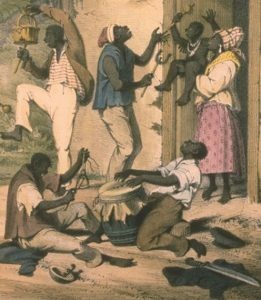 So it was only natural that the slaves, stolen from their native African homes and music, would try to emulate their memories and create something that they could play to feel like a little part of home was still with them. The torment they suffered was hideous, but the moments that they could play songs together somehow lifted them above their situation, if only for a moment. Such is the power of music. They didn’t have much. But what they DID have a lot of was… boxes, barrels and crates. In fact, that’s what the word “cajon” means in Spanish – “crate”! Wooden hauling crates, barrels or chests were used to store everything an invading army needed, especially food and dried tea. There was no lack of them lying around and they had a pretty solid bass kick when struck in the middle. Sound familiar?? Who was the first stolen musician to pick one up and start thumping on it like a drum? We’ll never know, but I’m standing up to salute his memory right now. You will always be remembered now, our brother in groove!! In the centuries that followed the instrument grew slowly in popularity from the slaves on tea plantations, to Spaniards who adopted the instrument into Flamenco music, to other European musicians who took notice. 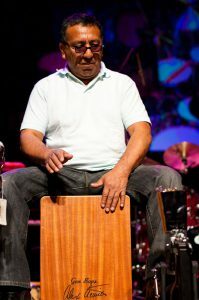 A couple modern players really brought the instrument into focus through their consistent use of the instrument: Alex Acuña, an L.A. session drummer & percussionist from Peru, has had the cajon as part of his arsenal since the 70s. I witnessed this firsthand when he was booked for a session with “The Yellowjackets” at the studio I worked at in North Hollywood. The man had an EPIC amount of percussive toys! Paco de Lucia, a renowned Flamenco guitar virtuoso, also brought the cajon into the spotlight by incorporating it into his regular repertoire and writing with it in mind. Now, centuries after its humble beginnings, the cajon is well-established in today’s Western music scene. Now, any set of hands eager to rhythmically assail a solid surface, for beat’s sake, can pick up one of these unpretentious yet pragmatic boxes of beat, and play excitement to the open skies! The “SLAP”-pin’ Sounds of Today’s Cajons! 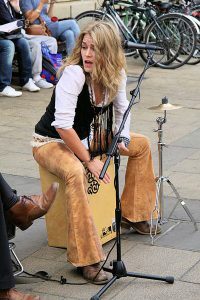 Cajons today are used mainly for acoustic, stripped down music and live performances. 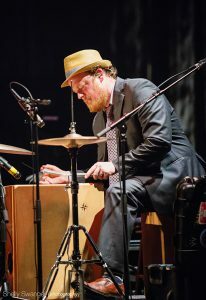 I have seen many live shows that featured cajon in the percussion section. Some shows even had only cajon for rhythmic backup. If you’ve never heard a cajon, or if you’d like to hear what many cajons by diverse manufacturers sound like by comparison, WATCH THIS VIDEO. One of its main benefits, of course, is that instead of dragging multiple cases, drums, hardware, cymbals, and percussion toys to a gig, you can simply pick up ONE BOX and walk smiling out the door. Setup and tear down?? What’s that?! All you do is set your box down and sit on it – you’re ready, baby!! Cajons are, more and more, starting to be incorporated into live performances by well-known, renowned artists. Just yesterday, for example, I clicked on Netflix as I ate my dinner and watched Steve Martin & Martin Short’s live show. The show was funny and full of anecdotes and personal reflections from the two men. Definitely worth watching if you haven’t caught it yet. Near the end of the show, though, Steve brought out his backing band to join him for some bluegrass music that he’d written and played it on his banjo. 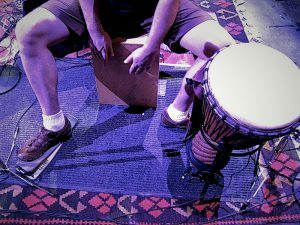 The drummer, Mike Ashworth, was playing a kit that included a cajon, and it went perfect with their “Appalachian sound”: acoustic guitar, acoustic bass, acoustic banjos… all instruments that prefer a softer rhythmic approach than the drums. The cajon worked perfect! The cajon is starting to catch on a bit in the recording studio, but it’s still not very popular for that particular use. I tried and tried to find actual studio recordings by well-known artists that have cajon in the mix, but came up with squat. You’ll also find in today’s drum marketplace plenty of accessories for the cajon – so many it can practically be turned into a pretty convincing simulation of a regular trap kit (watch that Steve Martin special for a great example!). Castanets, jingles, clave blocks, foot pedals… there’s a plethora of options to stick on or around your cajon these days. Give ’em a try. They’re all still small enough that you’ll probably still be able to put everything in one bag, over your shoulder, and get to your gig with ease. Now that’s efficiency! My, my… what a long way the Cajon has come! What once was just a simple wooden crate now has a whole marketplace of options, sizes, shapes and accessories… it wallops the mind!! Tho’ they’re all basically a box or slab that you hit, the sixth is a much different hybrid version that we’ll explain soon enough. If you look hard enough you’ll also find some one-offs – cajons that are built in weird, different configurations, but are only put out by one company to see if there’s any interest in their off-the-BEATen-path design. HERE’S ONE by Schlagwerk, for example. Configurations and uses will be as varied as there are people’s preferences, but really the six above are what you’ll find 99% of the time. These are your basic cajons. Nothin’ fancy, just the box and a few sounds for you to draw out by pounding away. With the standard version, you SIT upon it and play the instrument by slightly leaning forward (NOT bending) and pounding out your passions with the palms of your hands down just below your kneecaps. It’s important that you don’t get in the habit of slouching forward to play, as that will, over time, turn you into kind of a Qausimodo-looking player, and tho’ that might be a hit with the ladies (it was in Disney’s movie! ), you might regret it when you try to reach your dusty mallets on that upper shelf. These big box “chairs” have excellent bass response, since they have a large chamber inside to bounce big bass waves around. Sometimes these models have a bass port (a HOLE, basically), and sometimes not. If you get one with a bass port, you can stick a mic in front of it and get quite a convincing “kick drum punch” when you need it. Some of these cajons will come with pickups already installed inside. Most will not. If you ever DO want to put your cajon signal through a P.A. or amp, however, there are pickups available, like THIS ONE, for you to install easily and solve that problem with minimum effort and learning curve involved. This type of cajon is what I first bought and have stuck with. I personally don’t LIKE the posture you have to use with a standard cajon. Even when you try not to slump, it still feels like I can’t keep my spine straight. It’s probably because I’m 6’2″, so it’s more of a reach for me than shorter groove-meisters to get down there where the bass really booms. In any case, I really like these “Slap top” models. Currently only Meinl makes them, but I bet eventually we’ll see them from all the major manufacturers when the patents allow. I bought the “Makah Burl wood” cajon of this type years ago. The pic to the left shows me havin’ a bangin’ good time walloping out the rhythms with it while recording it all via the mics into Pro Tools. 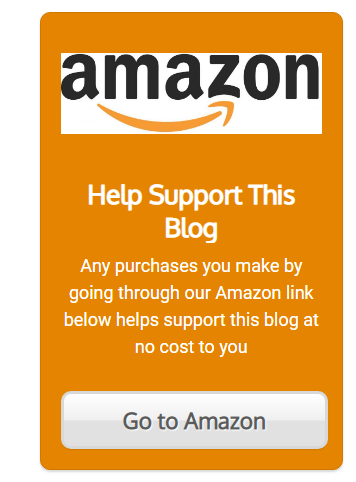 Check out the review I did of it by CLICKING HERE. The clear advantage with these is you can sit up straight and interact with the audience without straining your neck upwards. Also, in the studio I can sit as normal, in my control room chair, and play it while operating my studio gear without changing my posture or position at all. I like that. The slap top models will not, however, produce as much bass response, since inside they do not have as big a reverberatory chamber. I find if you are mic’ing the cajon, this does not matter, but if you plan on using the cajon mostly for open air concerts with no P.A. system or amplification, then the bigger cajons that you sit on will give you a deeper bass response. As with the standard cajons, some come with pickups, most do not. Adding a pickup is simple to do however, as I mentioned above. It all depends on what kind of gigs you’ll be playing and what, if any, amplification you’ll need. This week I’m finishing up a review of a newer Meinl slap top that came with electronics built in. Stay tuned here at Serious G.A.S. for that in-depth comparison and hear how the pickups fare, compared to the sound through microphones. Now, these are not a box. At least, not much of one. 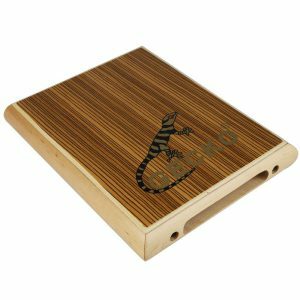 They are basically just a slightly hollow slab of wood or plastic about the size of a computer tablet, so their bass response is, uh… pretty non-existent. Still, if you don’t mind low volumes (most people mic these) and a different approach, this stripped-down approach to the cajon and bongo sound might be just the ticket for your musical explorations. You could also, as with the others, stick a piezo pickup on the wooden surface and send that signal through the P.A. or amp, instead of mic’ing it. If you don’t amplify it, then you’re sure to be drowned out if you have several other louder instruments jamming with you. To watch a video of a tablet player, click THIS LINK. 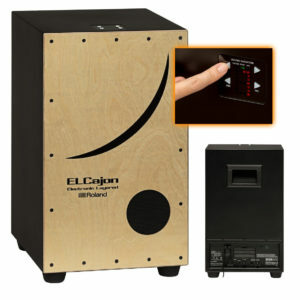 Like the portability and ease of the cajon, but want a wider array of sounds to choose from? No problem! Enter the electronic cajons! These products give you a box, or a slab, of wood to pummel, but they also provide an electronic system that will trigger dozens of other desirable percussive sounds. Any of you familiar with MIDI triggering will know exactly what I mean. By far the most popular of these models is the Roland EC10, which you can hear in all of its glory by GOING HERE. 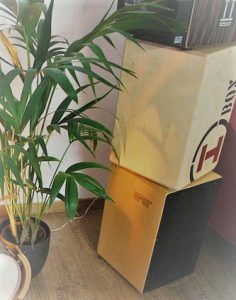 This kind of approach certainly will brand you as a cajon player who has, at any needed moment, a diverse and well-rounded sound set that can complement any song genre. You can even sound just like you’re playing a real trap kit if ya want. The Roland unit, for example, provides SIXTEEN different drum kit sound samples, giving you just the right kit sound for just about any genre of music. have a good track record of dependability in their products. 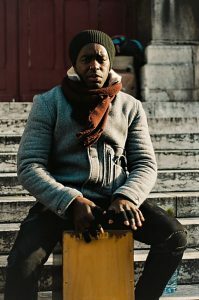 Are there other small companies, and even individuals, making cajons of all styles, colors and sound qualities across the globe today? You bet! One quick search for a cajon on “Etsy” will show you what I mean. If you wanna support the little guy, go for it. Feel free to explore the vast Internet frontier of home-grown rhythm boxes. You’ll find hundreds of weird and (sometimes) wonderful options all over the Internet, Make sure you ask about warranties, shipping costs, repairs and the like before you buy. The “little guys” don’t often have the support in place after the sale that we’d like to trust is there. With the large corporations that I listed above though, you’ll tend to get a lot more color and style options, as well as a solid warranty to protect your investment. So, if dependability and “BAM” for your buck is important to you, stick with the companies I listed. They have a long, respected history and, as I’ve experienced, won’t let you down. 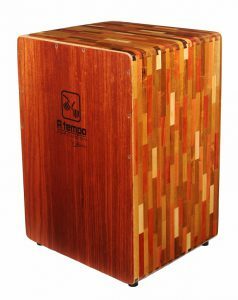 Here’s a bit of insight, by the way, if you ever run into the following designations: if the cajon you get does NOT have snares inside, it’s designated a “Peruvian style” cajon. Basically it sounds like you’re only playing a crate or a box (remember the African slaves in Peru?). 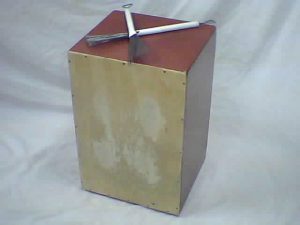 Those cajons with snares installed (which is by far the majority) are called “Flamenco style” cajons. 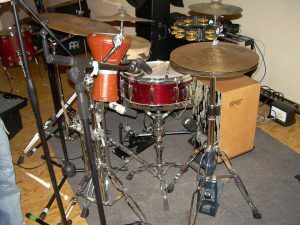 This is what allows modern day cajons to sit in for full drum kits for acoustic bands, the fact that you can get a low kick and a high snare sound out of one small instrument. There. Now you’re knockin’ in the know! You’ll want a good instrument to start on, but you probably also want great value and a lower price, since you’re just beginning to check this Peruvian “crate” thing out. 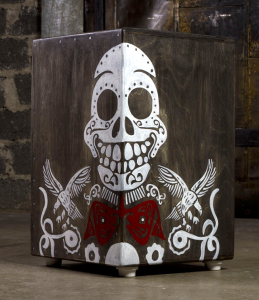 No worries – the Meinl Compact Jam Cajon is your best bet. This cajon is slightly smaller than most of the higher-priced models, but that just means it’s lightweight and easy to carry to gigs! Because of its smaller size though, it’s not going to pump out as much low end as the bigger, more expensive models. 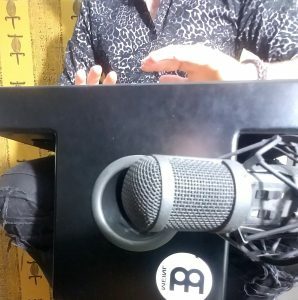 You can mitigate that, however, by putting a mic on its sound port and cutting the high end through the EQ on whatever mixer you’re running through. If you’re going to play without any amplification, this cajon will be fine as long as there’s not too many other musicians, and as long as everyone else is playing non-amplified instruments like you are. It’s got a 2-year warranty so you’re covered if anything goes wrong. A definite benefit to have when you’re first starting out. To get a quality cajon made by a respected manufacturer, that’s this portable, for under $70… in a word: sweet. To see it and HEAR it in action, GO HERE! You’ve been in this game; you know your stuff. But maybe you haven’t peeked into the market recently to see some of the new offerings. 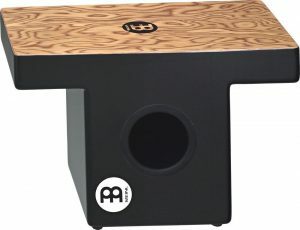 My favorite cajon sound this year comes from a newer company… out of Sweden, believe it or not! Valter Percussion is producing, in Europe, a series of cajons that sound GREAT. I’ve watched several videos on their products and am really impressed by the pro sound they get out of their designs. My favorite they’ve made is the “Big Box“. To my ears, it’s a cajon that could really fool people’s ears into thinking that they’re listening to a real drum set. The bass hits sound so much like a real kick drum hit it’s freaky! It’s mostly because of an internal baffle they put on the front plate. An excellent innovation that makes all the difference! Unfortunately, no one here in the States sells them. If you want to though, you can personally special order one for yourself via their WEBSITE HERE. 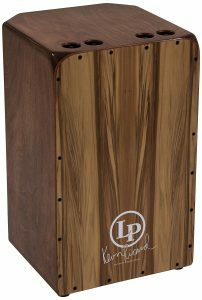 If you want a no hassle, get it here, now, kind of product, then I’m really stoked by the Kevin Ricard Signature String Cajon by Latin Percussion. This cajon has great tone, a superb look, the latest ergonomic form, and tuning flexibility unparalleled by most other cajons. Let Kevin walk you through what sets it apart by watching THIS VIDEO. Kevin Ricard has played for Sting, Kenny Loggins, American Idol, and had a long stint bein’ the groove meister for the Tonight Show as well. The dude is the epitome of what a professional is all about. The fact that he helped design this cajon and is proud to put his name on it… is all the “POW!” we need to know. This instrument is going to serve you well. One of the best parts of getting an instrument is… playing it! Ahhh, the joy of woodshedding for days, and days, studying songs, patterns and approaches… and soon finding that YOU can really make the instrument speak! As you accumulate skills through tapping, beating, punching, slapping or battering your own cajon, it will become easier and easier to slip into any song and be a great rhythmic accompanist with the cajon. At that point, you’ll probably find yourself getting called on to play with others frequently. With practice will come renown. You’ll then probably get serious G.A.S., like the rest of us, and just have to have a couple more (or five… or ten??) expressive cajons for your collection. But here’s where ya start. Get that beat box in your tremoring hands and strike away… who knows what spotlit stages await you?!! Let us know here at Serious G.A.S. how your cajon journey goes. Are you taking the plunge and starting to play? Are you an old cajon pro? Have you tried the latest, greatest electronic approach?? Let us know in the Comments section. We’re all gear heads, anyway, so all your stories intrigue us! Until we all sit in a drum circle and jam… go… make… sounds!! I’ve got a great idea for you, based on what you’ve been thinking. Quite a few drummers switch their drum PEDAL to their cajon and play that with their foot. That does work well for what you’re going for, however, since I also do gigs like you with guitars and P.A. setup, I know you probably want to keep the size of things down. Rather than a big kick drum pedal, I like the set up that THIS VIDEO shows you, using a Meinl pedal. Perfect for our kind of stripped-down, one-man or two-man-show gigs. What a well-written and informative post you have here! First of all I want to comment on the invasion of the Inca people. This is what greed did to the Spanish – it turned them into monsters who were willing to wipe out an entire civilization. However, on a more positive note, I am very familiar with the cajon. 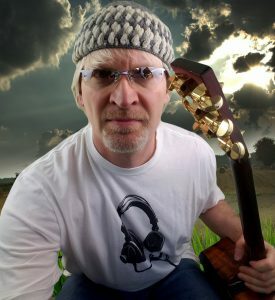 I am a singer/songwriter who plays out quite a bit (mostly in coffee houses/cafes) and will often see acoustic guitarists accompanied by a cajon player. I have always been captured by the simplicity and lovey tone of this instrument! I have been thinking about incorporating a cajon into my performance. Since I almost always play solo, I have often thought I needed a little “bottom” in my music but didn’t want to go through the hassle of setting up an entire drum set. 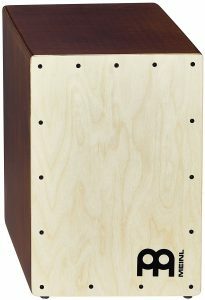 The Meinl Compact Jam Cajon seems like a great deal for $69.99.